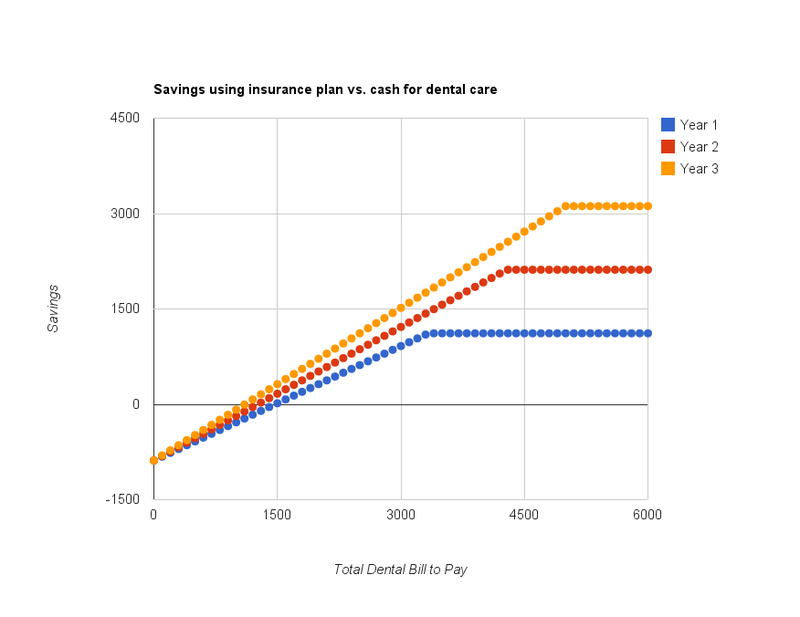 I wanted to figure out at what point it’s better to have dental insurance for the family vs. just paying with cash as I don’t have any coverage with my work; so here goes. I was basing it on Blue Cross’ posted rates for a family ($783 + $100 deductible). They pay out 60% of the cost in the first year (70% in second and 80% after that) up to a maximum of $500 per person per year in year 1; $750 in year 2 and $1000 in year 3. 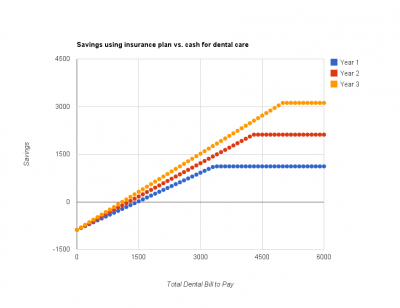 For the four people in our family, we would need to pay the dentist an average of $368 per person in the first year to break even against paying cash (up to a total of $833 per person). On Year 2, we would need to average $315 to a max of $1071 and on year 3+ the average would need to be $276 with a per person maximum of $1250. It seems like you’d need to spend a lot on dental in order to make this work but maybe having insurance would make your dental hygiene more of a priority and less of a problem down the road. Also, if you kept it around for a little while; in Year 3, your whole family insurance can be worth it for one person’s big bill.